Brace yourselves friends, I'm going to talk about breast feeding again. Just over three years ago I shared my choice to stop breastfeeding Ella when she was just 7 weeks. At the time, it felt like such a hard heavy decision and disappointment, but now that she's basically a grown up (as in she turned three last week) it seems so silly to have cried over breast milk. I was exclaiming to a friend recently how different the second baby experience has been than the first, to which the friend replied "Of course, its different. You're a whole other person than you were 3 years ago!" Duh. Being a mom to Ella prepared me to be a mom for Emmett. My breastfeeding experience with Emmett has also been tremendously easier. One thing I learned between Ella and Emmett is that there is a whole list of foods that are actually reported to increase a mother's milk supply naturally. Galactagogues are foods that naturally promote breast milk production. While little scientific data exists, anecdotal evidence suggests that consuming food such as fennel, chickpeas, or papaya will help breast feeding mothers. Oats and other whole grains and beer are also reported to have the same affect. There's a small niche of food companies working to full fill the needs of nursing mother's and I actually stumbled upon the idea of lactation cookies through Amazon (which has saved me too many times during these "new mom of two" times). I tried a few pre-made cookies as well as some mixes for "milk maker" cookies cookies. Whether they actually worked or there was just a placebo affect - I decided to create my own cookies. These 'lactation' cookies are a hack of my favorite oatmeal chocolate chip cookie. Oats are regularly prescribed to nursing mamas for milk supply. 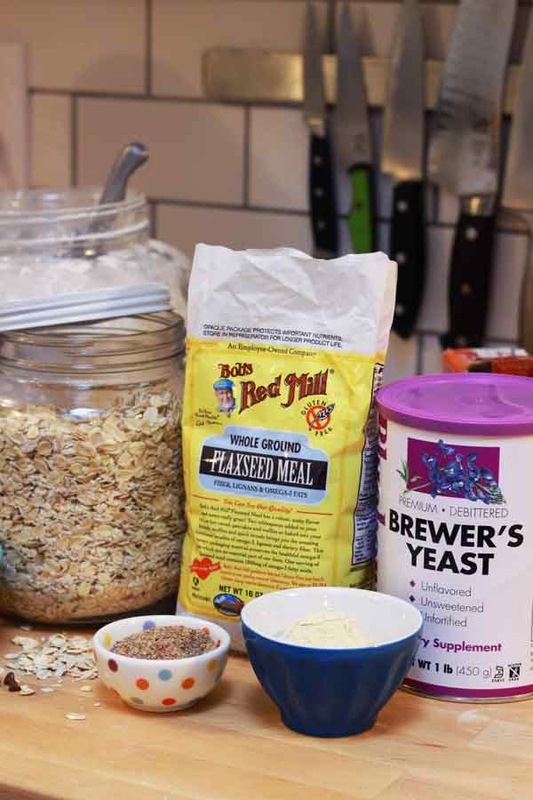 Flaxseed meal and brewer's yeast are added for the same reason and both were easily found at my local Whole Foods Market (you can also order both on Amazon). I've decreased the chocolate (which can some times upset tiny tummies) and messed with the sugar ratio a bit. 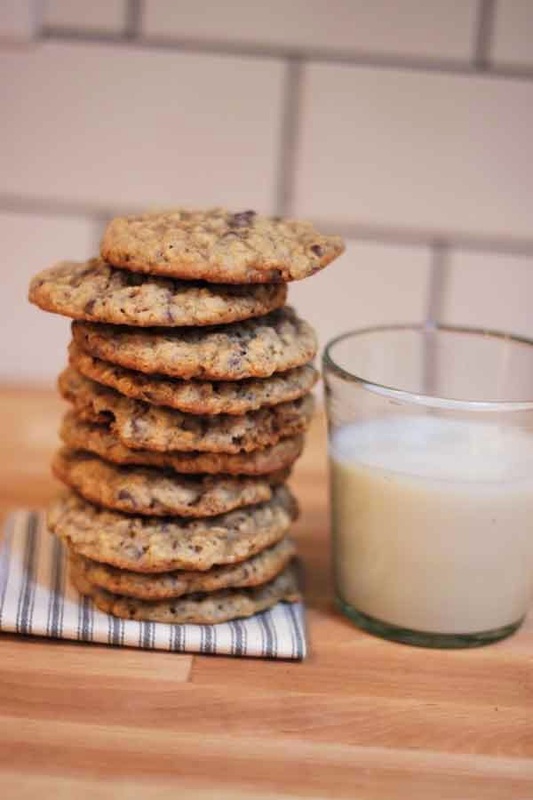 I wasn't even planning to share this recipe, but this is seriously the best oatmeal chocolate chip cookie recipe I have ever had. The edges are crisp but the rest of the cookie is pleasantly chewy, there's just the right amount of cinnamon and chocolate. And here's the thing - you can't taste the flaxseed or brewer's yeast - so unless you tell them no one would ever know that this cookie helps with lactation. 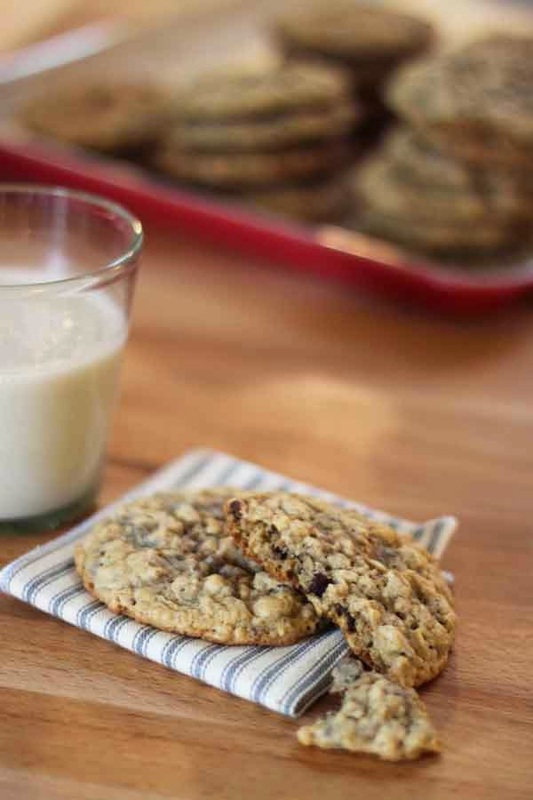 These cookies are designed to help breast feeding mamas increase their milk supply. They will not introduce lactation in Dads, kiddos or neighbors - so feel free to share. 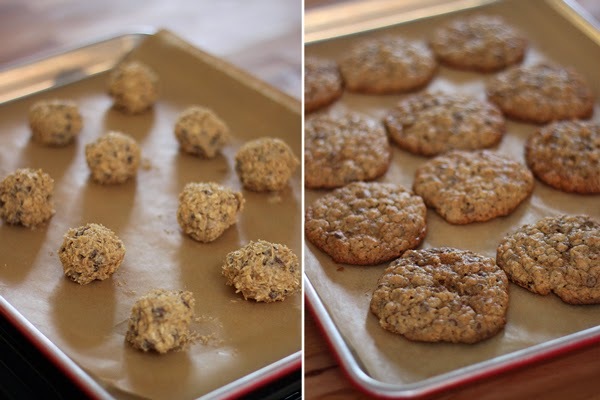 If you just want to enjoy these as the best oatmeal chocolate chip cookies - omit the brewer's yeast but leave the flaxseed meal and be sure to refrigerate the dough as directed below. Combine the water and flax seed meal in a small bowl and set aside. Beat together the butter and sugars in until lightened and fluffy. Add the water-flax mixture, eggs, and vanilla extract and beat until well combined. Add the flour, brewer's yeast, baking soda, salt, and cinnamon and stir to combine. Finally add the oats and chocolate chips and stir to incorporate. Scoop the dough into 2 tablespoon sized rounds and refrigerate for at least 1 hour. Heat the oven to 350 degrees F. Bake 12 cookies at a time on parchment lined sheet pans for 8 to12 minutes. The edges should be golden brown and the middles should look slightly damp still - cool for 2 minutes on the pan. Then remove to a cooling rack. Does it matter if the Brewer's Yeast is powder or flakes? It doesn't. Just be sure you're using brewers yeast and not nutritional yeast or you'll have cheesy flavored cookies.